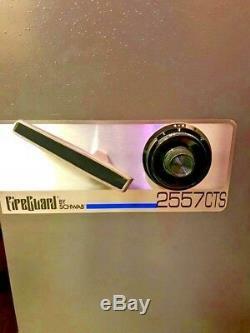 SentrySafe Combination Lock Safe Model 2557CTS. Great for jewelers, media, etc. Includes 10 pull-out storage drawer accessory. 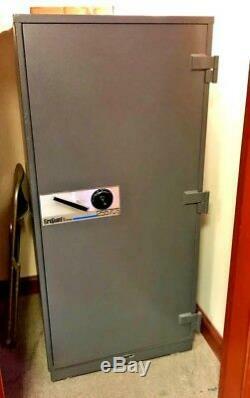 SentrySafe Safes are designed to handle the protection needs of any business. These products are manufactured to meet or exceed independent third party UL classification for fire protection and impact resistance. 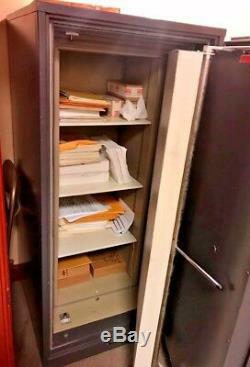 SentrySafe means peace of mind for all your important items. Equipped with a Group 2 combination lock and a UL certified re-locking device to set the bolts if the lock is punched in a burglary attempt. Overall width dimention includes 1 for hinge protection on single door safe. Overall depth dimension includes 1.75 for handle projection. Model 2557CTS carries the UL Class 150° 1-hour label. Casters do not swivel or lock. Safe accessories are all off-white. Exterior Dimensions 66.25 H x 30.75 W x 31.75 D.
Interior Dimensions 52 x 19 x 16.25. Capacity 9.3 Cubic Feet. Fire Rated Time 1 Hour. 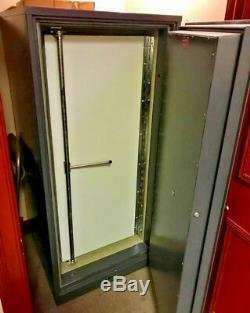 The item "SentrySafe Combination Lock Safe 2557CTS Fire/Impact Resistant, 10 Drawers" is in sale since Wednesday, January 2, 2019. This item is in the category "Home & Garden\Home Improvement\Home Security\Safes". The seller is "usmar_6ci26ll44" and is located in Front Royal, Virginia. This item can be shipped to United States.